Apple is working on three colors for this fall's 6.5-inch OLED iPhone, and five for the 6.1-inch LCD model, according to well-connected TF International Securities analyst Ming-Chi Kuo. The iPhone X in an unshipped "blush gold." The 6.5-inch phone could come in black, white, and gold, Kuo said in a memo obtained by AppleInsider. The 6.1-inch device meanwhile could potentially ship in gray, white, blue, red, and orange. "Gray" and "white" may refer to the existing Space Gray and Silver shades Apple uses, particularly since Silver iPhones sometimes have white front bezels. The iPhone 8 is sold in Gold, Silver, Space Gray, and (Product)Red, while the iPhone X is available only in Silver and Space Gray. In general the company has avoided deviating from any of these shades in recent years, which might cast doubt on Kuo's claimed 6.1-inch colors. The analyst is known to have good connections in the Apple supply chain however, and there is some precedent. 2013's iPhone 5c came in a range of bright colors, namely blue, green, pink, yellow, and white. Since this year's 6.1-inch iPhone is expected to be a similarly mid-range product, Apple could be adopting other parallel strategies. 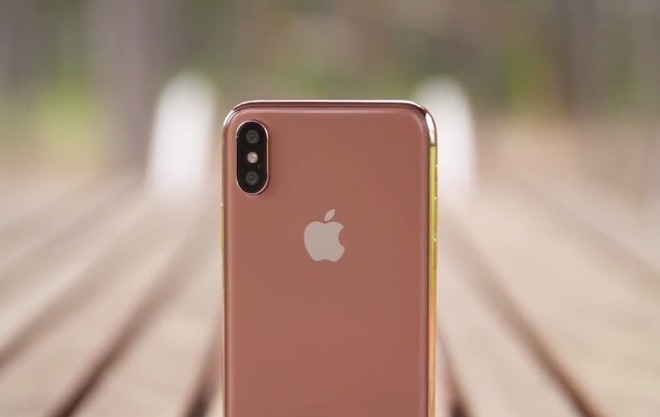 In May, Rosenblatt Securities' Jun Zhang also suggested that the 6.1-inch iPhone could come in several colors, though he claimed they might include blue, yellow, and pink. Apple has periodically been rumored as working on a gold iPhone X, both before and after launch. If true it may be that the company has had a hard time producing the color, and/or didn't see much market incentive to sell it. On top of the 6.1- and 6.5-inch devices, Apple is also believed to be working on a new 5.8-inch OLED iPhone as a direct follow-up to the iPhone X. Kuo suggests however that the 6.1-inch LCD model could take 50 to 55 percent of launch sales, and an even bigger share going into 2019, aided by a price under $700. The analyst is raising his overall forecast for new iPhones from 75-85 million units to 80-90 million.